Dream Designer display board includes close-up color images of the products selected. You also get actual samples of vinyl siding. The widespread popularity of vinyl siding continues to surprise virtually everyone involved in residential construction, including new-home builders, remodeling contractors, architects, designers and homeowners. Once considered a poor-man’s option to real wood siding, vinyl has made great strides in the past several years with improved manufacturing techniques, higher-quality siding, better installation systems, increased energy efficiency, and many new colors and styles. And the results are undeniable: According to the latest statistics from the Vinyl Siding Institute, vinyl is the number one choice in exterior siding for new single-family homes—and has been for 16 consecutive years. 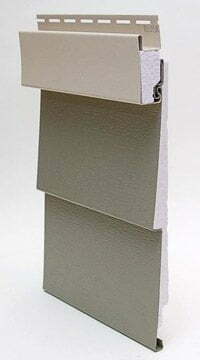 Vinyl siding back-filled by energy-efficient polystyrene foam insulation. Vinyl is particularly popular in the Midwest, where 70% of new homes are clad in vinyl, and in the Northeast, where an incredible 85% of new homes have vinyl siding. Now that doesn’t mean vinyl siding is loved everywhere. Stucco still remains king in the West, with nearly 60% of the new-home business; vinyl has less than 10% market share. And in the South, 30% of new homes are sided in vinyl, as compared to 40% in brick. However, what’s clear is that vinyl siding is here to stay and will continue to offer low-maintenance, high-quality products for homes in all price ranges. In 2010, vinyl siding was the number one choice for new homes that sold for up to $499,999. If you’re building a new home or remodeling an existing one, and are considering vinyl siding, then you’re in luck. Exterior Portfolio—a leading manufacturer of premium-quality vinyl siding—has just launched a newly enhanced website visualizer, called Dream Designer. For the uninitiated, a visualizer is an online design tool that allows you to see what a particular product will look like on a home. With just the click of the mouse you can instantly change paint colors, siding styles or window sizes. It’s a fun, fast way to customize a home, without leaving the comfort of your desk. I tried Dream Designer recently and discovered that, unlike most visualizers, it offers much more than just online images of the remodeled home. You can choose a home from its data bank of 20 different styles, or—and this is the really cool part—you can download a photo of your actual home. Then you can very easily and quickly scroll through a wide variety of siding colors and patterns, architectural elements (such as window and door trim), wall corners and decorative finishes. You can even select a roof color. And again, you can change all these components with just the click of your mouse. On the rear of the Dream Designer board are before and after photos of your home and detailed information about the siding products. 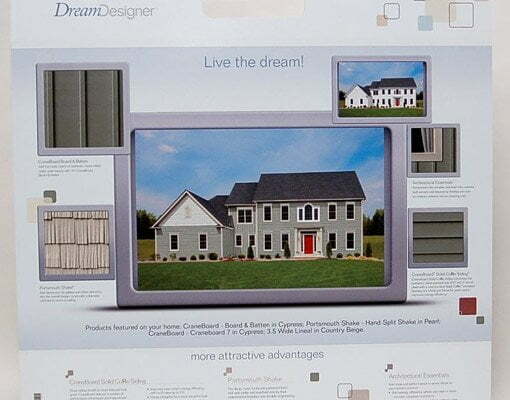 However, the most unique aspect of Dream Designer is that after completing your exterior design, you can order a 2×2-foot Dream Designer display board that has high-resolution, true-to-size color images of the products chosen. On the back of the board are before and after photos of your home, and close-up images and detailed information about all the Exterior Portfolio components. It took me about 20 minutes to complete the custom design shown here, and my Dream Designer board arrived at my doorstep in just two days. But that’s not all. Two days after that, a second package arrived with actual samples of the siding, shakes, and window trim. 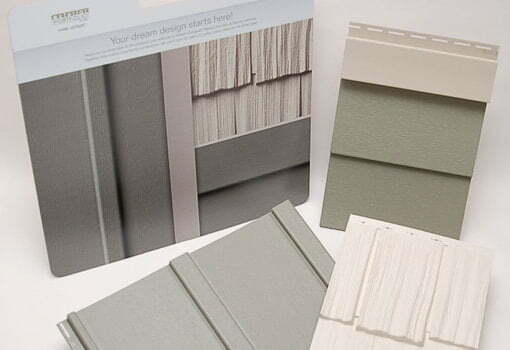 Between the Dream Designer board and product samples, this system completely eliminates all the guesswork that typically goes into picking exterior siding products. The Dream Designer program is free for designing home exteriors online. The Dream Designer board and product samples cost $20, but that fee is refunded if you purchase the products from Exterior Portfolio.